Usually, Taco Bell relies on stuffing its latest stunt foods with insane combinations of meat and cheese to appeal to your nocturnal inner glutton. But now, it looks like the Doritos Locos fast food chain is betting on a decidedly different ingredient for an all-new menu item: super-spicy Carolina Reaper peppers. Taco Bell calls it the Reaper Ranch Quesarito, and just as its name suggests, the cheesy burrito is made with a sauce containing the red and gnarled pepper that was once considered the spiciest in the world. To be clear, Carolina Reapers are no joke. They can register as high as 2,200,000 on the Scoville Heat Unite (SHU) scale, which according to a ranking by PepperHead.com, is about 200 times spicier than an jalapeno. In fact, only two other peppers on the planet claim to be hotter than the Reaper, though it doesn't seem like there's a definitive ruling on this. Thankfully, it sounds like T-Bell is toning the insane heat down a bit on the Reaper Ranch Quesarito by cutting the spiciness with ranch dressing (definitely don't underestimate the spiciness, though). 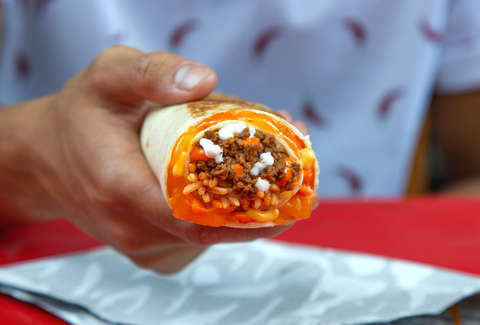 Each one is made by stuffing seasoned beef (or steak), rice, and sour cream into a tortilla, then wrapping it inside of another tortilla with nacho cheese and Reaper Ranch sauce in between. We usually recommend squeezing a packet of Fire Sauce on most Taco Bell items, but in this case, it's probably unnecessary. A Taco Bell spokesperson said the Reaper Ranch Quesarito is currently being offered as part of a test offering at the chain's locations in Milwaukee, Wisconsin through mid-November. After that, there's a chance it could start hitting menus elsewhere, depending on how well it's received. With that said, don't mess this up for everyone, cheeseheads. Tony Merevick is Senior News Editor at Thrillist and pounded a fistful of TUMS just writing this story. Send news tips to news@thrillist.com and follow him on Twitter @tonymerevick.